Is team spirit limited to sports? 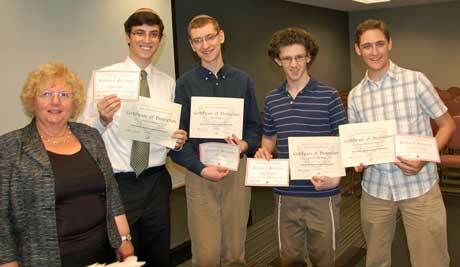 Irene Stein, Torah Academy of Bergen County in Teaneck’s math league advisor, left, with Shlomo Klapper, Yakir Forman, Natanel Friedenberg, and Gavi Dov Hochsztein, American Mathematics Competition winners who qualified for the American Invitational Mathematics examination. When it comes to brain vs. brawn, who gets the accolades? The question arises following some stellar performances in the academic world: Torah Academy of Bergen County in Teaneck brought home multiple awards in math competition. Three students from Ma’ayanot Yeshiva for Girls in Teaneck just were honored in Washington for winning a prestigious science competition. A student at the Frisch Academy in Paramus came out on top over 400 other students in a Talmud competition. The schools field a full range of athletic teams, among them baseball, basketball, hockey, soccer, softball, swimming, tennis, track, and volleyball. But they also compete in such areas as chess, debate, mock trial, Torah Bowl, New Jersey Challenge, Science Olympiad, and math. “We at TABC emphasize participation in all extra-curricular activities, be that athletics or academics,” said Arthur Poleyeff, principal for general studies at the Teaneck school. The students experience intrinsic rewards, said Rookie Billet, principal at Ma’ayanot. “When the team brings a trophy, all the kids cheer,” and the praise of their teachers counts for a lot, she said. At The Frisch School in Paramus, Principal Kalman Stein said academics share the space on the podium with athletics. “Sports are important, but they are not that important,” Stein said. “The ‘big man’ or ‘big woman on campus’ is more often than not not an athlete,” he said. By the numbers, TABC has had a winning year in math competition. Yakir Forman, a junior, won the first prize of $1,000 in the inaugural Jacob Goldfinger Memorial Mathematics competition sponsored by Touro College’s Lander College for men. Senior Netanel Friedenberg won the third prize of $100, and junior Moshe Kollmar took honorable mention. Tzipporah Greenberg, a sophomore at Bais Yackovin Passaic also took honorable mention. There were 96 participants from around the country. In the New Jersey Math League competition, TABC placed fifth-highest in the state and first in Bergen County. The Mathematics Association of America uses a series of competitions to choose a six-person team to represent the United States in the math Olympiad. Although he didn’t make the final team, Yakir, a junior, finished in the top 80 out of 100,000. Shlomo Klapper, this year’s TABC valedictorian, shared insights about these kinds of competition. He speaks from the experience of his roles as captain of the Science Olympiad, Torah Bowl, and College Bowl teams. He explained that the math competitions are in test format and take place within the student’s school. This kind of competition is not a spectator sport. “You can go to a hockey game, but you can’t go to a math competition,” he said. “It is a solo experience, you’re flying alone,” he said. Other competition are out in the open, though – the College Bowl championships, for example. The Torah Bowl is in more of a quiz show format, with competitors pressing a button to buzz when they have an answer. Picking a question at random, Shlomo demonstrated an answer involving logarithms, a concept that has mystified this reporter for decades. After Shlomo’s explanation, the concept is still mysterious, but less so. In some cases, like the Science Olympiad, contestants have to practice, he said. In other cases, though, you can’t really study because the subject matter is so broad. Asked what was one of his out-of-the-blue questions, he recalled a U.S. history question: Who was the British prime minister during the American Revolution? He just happened to have the answer filed in his brain – Lord North. He said he was in school from about 7:40 a.m. to 5:25 p.m. Asked how many hours, caught without a calculator, he had to think a bit. Nine hours and about 45 minutes, he figured. “A calculator is such a terrible crutch,” he said. If there is a divide between brains and brawn, Shlomo speaks from both sides. Athletics have their place, said Shlomo, who was on the tennis and softball teams and runs now and then. “You can’t pickup and play college bowl, but you can with sports,” he said. While TABC is “very supportive” of academic teams, the satisfaction of winning is more within the team itself, he said. “After all, in the general sense, mainstream sports have been, and probably will be, cooler than the College Bowl,” he said. Shlomo will attend the University of Pennsylvania in the fall. His major? He doesn’t know yet. At Ma’ayanot, sisters Ariella and Eliana Applebaum, and Elana Forman, all of Teaneck, were national winners in the Toshiba/NSTA ExploraVisionAwards Program. The trio was cited for sifting through scientific literature and then forecasting 20 years into future for what the state of knowledge about human ability to regenerate limbs will be. The girls were in Washington, D.C., to receive their awards last week. The contest is in its 18th year, and this is the first year Ma’ayanot has participated. Each winner gets a $5,000 savings bond. Earlier in the spring, Ma’ayanot students Daniella Greenbaum of New York and Tzippy Steingart of Teaneck won first and third place in the annual Holocaust Memorial essay contest run by EMUNAH, a social service agency. At Frisch, the principal was speaking at the crest of a victory for senior Darren Sultan, who bested 400 students nationwide in the Yeshiva University Bronka Weintraub Bekiut Program. The contest is aimed at getting students to study Talmud outside the classroom. Darren won first place in the United States portion of the International Bible Contest two years ago, and last year was first among the non-Israeli competitors in the international contest. Jessica Oppenheimer, a Frisch senior on her way to Yale and captain of the debate team, said academic teams are appreciated, but athletic teams grab more of the spotlight. Soccer player Jared Hoch, also a senior, agreed that academic teams are appreciated, but sports teams get the edge. One reason he said is that academic teams often compete in a tournament setting, while the soccer team competes a game at a time. “When you win, everybody knows,” while academic victories are not as publicized, he said. Rachel Cohen, a member of the girls soccer team at Frisch, agreed that sports teams get more attention, but she said part of that is logistics. Debates, for example, are held during school hours, while sports games are after school, so student spectators can attend. But there is recognition for the academic teams, she said. “Everybody wants to show respect for their friends and show that they appreciate what they’re doing,” she said. It was a winning season for the Frisch girls team – they won the league championship. Rachel said their sports activity dovetails with their Judaic studies. 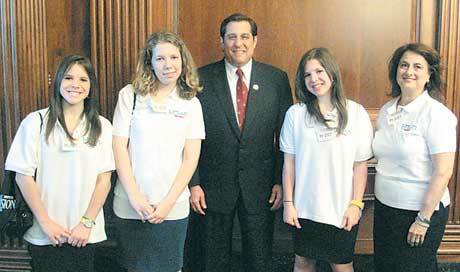 Last week, Rep. Steve Rothman welcomed Eliana Applebaum, Ariella Applebaum, and Elana Forman to Washington, D.C. The three students, from Ma’ayanot Yeshiva High School for Girls in Teaneck, are winners of the 2010 Toshiba/National Science Teachers Association ExploraVision Awards.